The Overture-Suite TWV 55:B11 has an interesting history, explained at length in the well researched notes by recorder player Ingeborg Christophersen. The title 'La Bourse' was added by a 20th century editor unfortunately, otherwise we would be able to credit Telemann with a wickedly modern sense of humour. The Frankfurt Stock Exchange ('La Bourse') was on the ground floor of Telemann's apartment building and it did in fact crash as part of the general financial mayhem of 1720 which included the so-called South Sea Bubble. The title of the final movement of the suite, L'Espérance de Mississippi, refers to the company in Louisiana whose stock made and then lost so much money for Frankfurt investors. It seems more likely that Telemann, writing around 1720, was referring in this and the other named movements about various peace treaties, to the positive benefits being enjoyed by his clients and friends before said crash. The music is typical Telemann and no more nor less entertaining than the untitled movements of countless other Overture-Suites in his vast catalogue. He apparently wrote over 3600 works, more that anyone in musical history so far as we know. It is quite amazing that so much is so good. J.S. Bach comes in at a mere 1200 and he was no slouch, but in his case we know a great deal was never catalogued and was lost. The Violin Concerto TWV 51:B1 is a lovely piece with an affecting adagio and the concerto for flute and recorder is a gem with the most delightful folk-dance finale that would be on every encore list where two such players perform together - which is why it is rarely heard. Recorder and flute seem a crazy combination but one assumes the players were there and Telemann was his usual businesslike self. These Norwegian players are absolutely top class. The violinist is also a leading light in the UK-based Orchestra of the Age of the Enlightenment. The wind players are international names too, so there is no questioning the technical and musical skills on display here. The recording is rather close and steely and does not given much space around the musicians but it is most certainly clean and clear with a subtle hint of the acoustic of Jar Church, Bærum near Oslo. Looking at the pictures on the Jar Kirke website the recording should have sounded fuller since there is a high gabled roof and a lot of wood but Kati Debretzeni's violin, for example, is quite edgy at times. 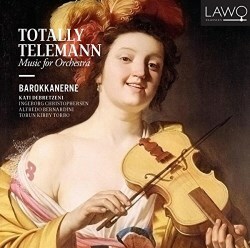 Not the most grateful sound then but good enough for us to enjoy these valuable contributions to the Telemann discography.